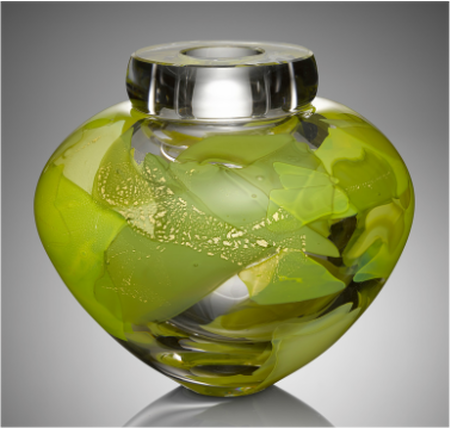 Contemporary hand blown glass sculptures, vases and vessels by Solin Glass. All works of art are made to order and ready within 4-6 weeks. Works of art are expertly packed and shipped via UPS Ground, signed by the artist. A picture of a dancer's fluid movement and the subtle gesture of the fabric in her dress inspired the color palette for this piece. The classic Asian shape allows the viewer to fully experience the coloration and technique. ​Inspired by the world famous Fontainebleau Resort in Miami Florida, the meditative bowl shape represents the depth of the ocean leaving you lost like you are floating in the optics and sense of space. Packaged like a present with a band of silver foil and iris gold. 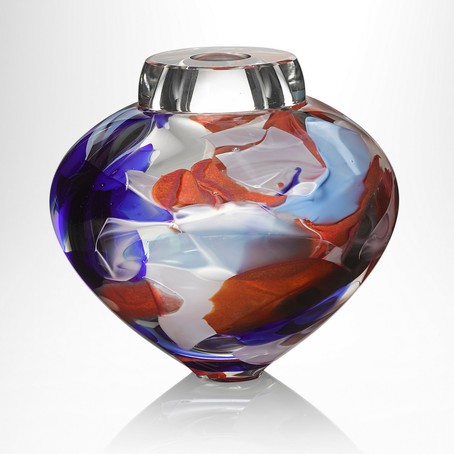 Hand-shaped free blown glass off the pipe, with a coloration of glass powders and sterling silver foil, finished with a striated glass ribbon. 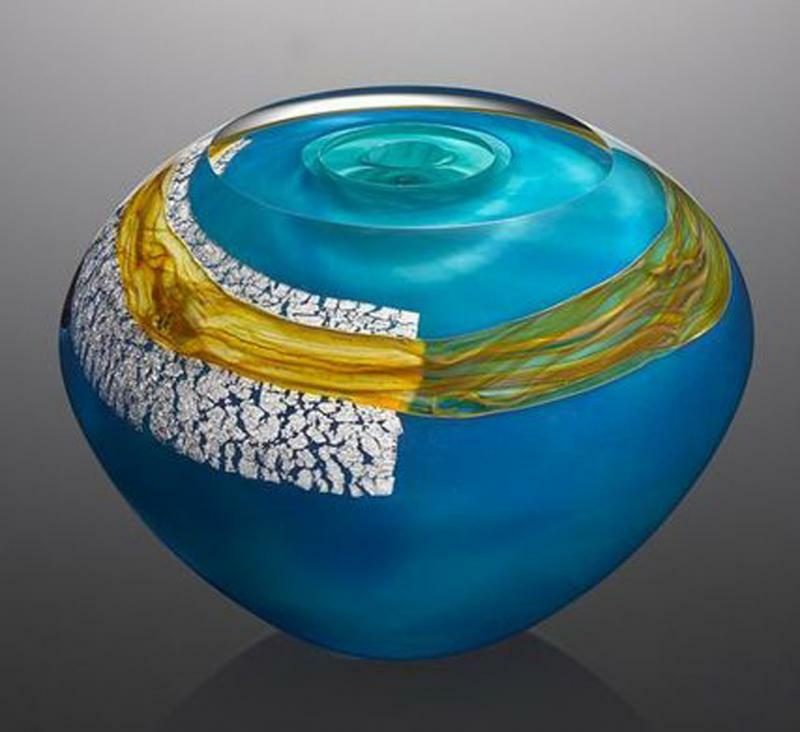 Colorful hues of turquoise blue, each glass art vase is custom made to order within 3-4 weeks. 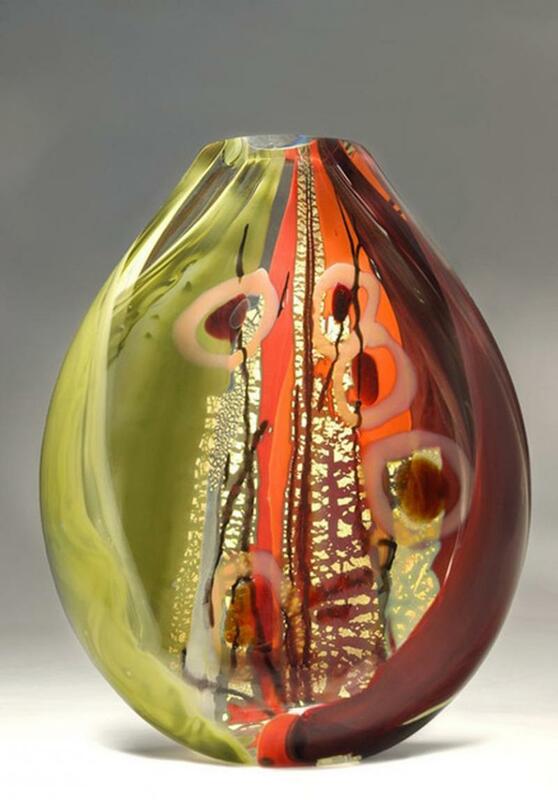 Inspired by the colors of Sedona Arizona, the Sedona glass sculpture by Solin Glass. 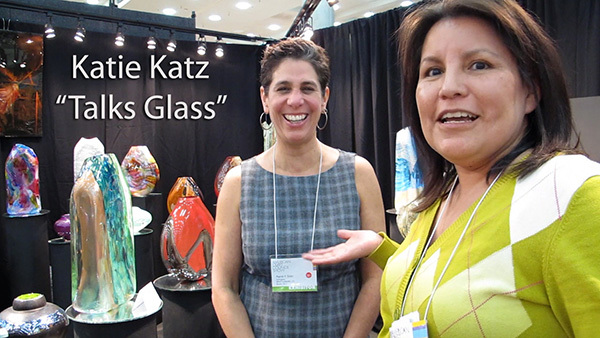 The Sedona glass sculpture is from Solin Glass's Window Series. 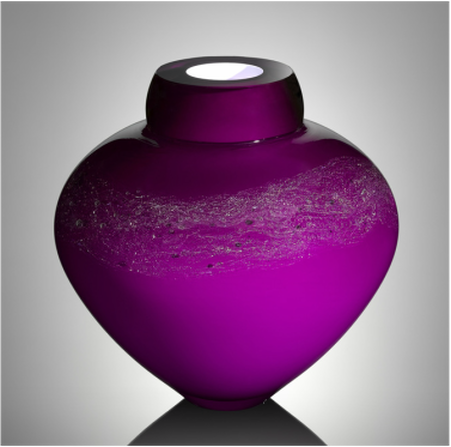 ​Each sculpture is hand blown with fine silver foil, cane frit and rod layers to create depth and new colors. Cut and polished top signed by Randi Solin. 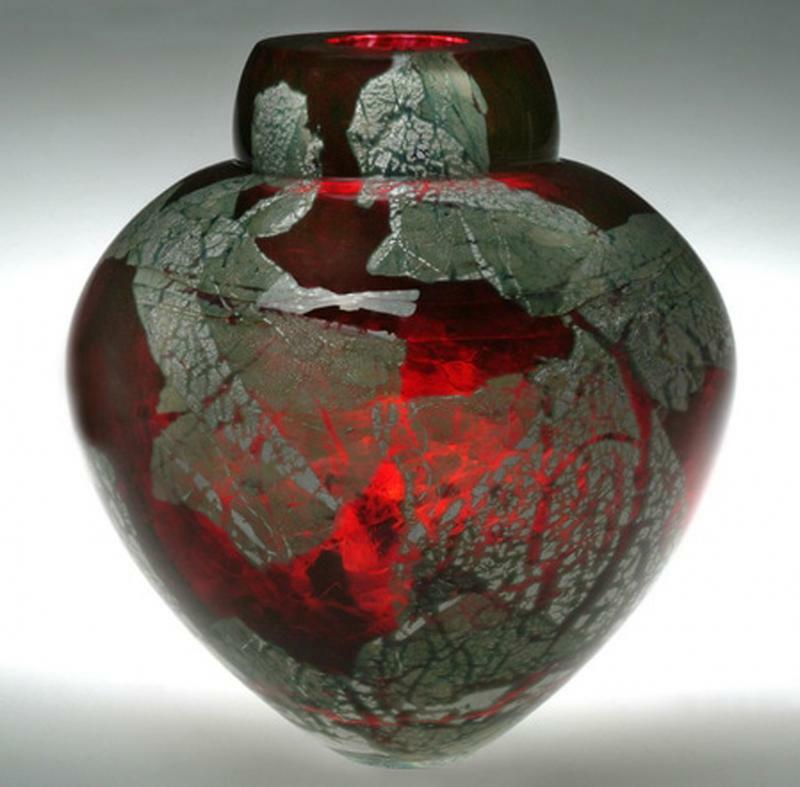 Hand blown glass in shades of red with sterling silver foil is custom made to order within 3-4 weeks. ​Hand-shaped glass sculpture, lying horizontally. 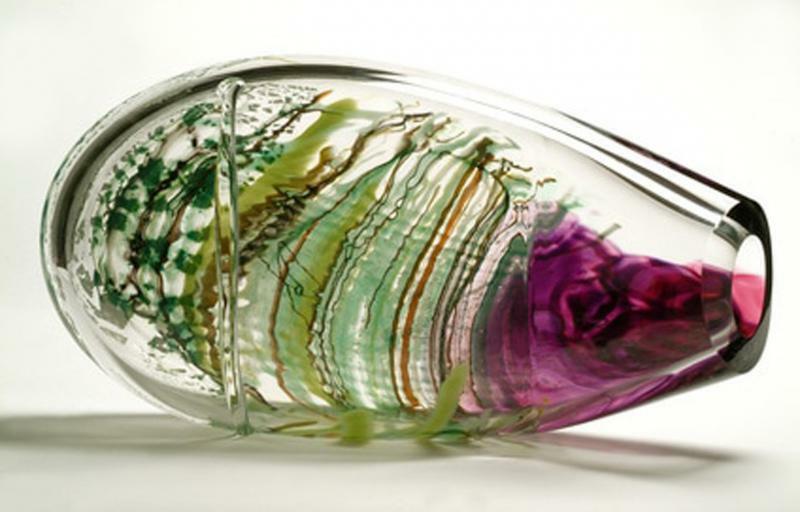 A bold coloration of purple and green color hues, which is achieved by using glass cane and color rods. Each glass sculpture is hand blown, not mold blown approx dimensions 18.5" x 5"
Opaque white and translucent purple glass rod are layered and combined with Japanese fine silver leaf. Shaped hot on the pipe. Cut and polished top.